ZANTEDESCHIA or Richardia belongs to the araceae family and is better known as calla lily. It was named Richardia after French botanist L.C. Richard. It is in demand as cut flower. Z. Africana is the one chiefly grown for its much-prized white blooms, mainly for church decorations while the smaller types make fine houseplants. They flower in spring and summers and make excellent bog plants with their handsome arrow-shaped leaves and elegant flowering spathes. They can remain in the ground through many years where the minimum temperatures do not go below 7ºC and partial shade at mid-day is available. Most of them bloom continuously if given sufficient food and moisture. These rhizomatous, rooting flowering perennials, are available in different varieties and hybrids like Z. alba maculata (spotted), Z. elliottiana from Transvaal (golden), Z. rehmannii from Natal (bright pink) and Z. apricot sunrise hybrids (pink, red and yellow). They range from one and half to four feet tall and have spathes measuring between four and eight inches. Plant them in soil one to two feet apart and cover with three to four inches of soil. They may need a heavy winter mulch of hay or coconut fibre to protect them from cold. Water moderately until early spring and then freely till flowering is over. Weak stimulants like standard houseplant fertiliser can be given to plants once the spathes show. The rhizomes must never be allowed to become dry during hot weather. 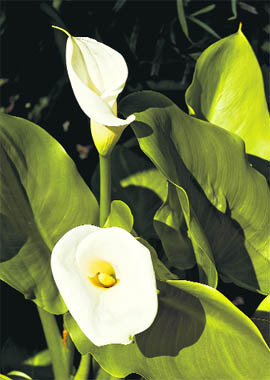 As houseplants, calla lilies need direct sunlight in the mornings and evenings. A compost comprising two parts rich fibrous loam, one part each of leaf mold and sharp sand with a little ground limestone is good for them. They should be potted in October and watered regularly. Place these out of doors in shade after flowering. Keep moist until repotting is required during next autumn. One plant should be potted in a six-inch pot setting it three inches deep. A sharp lookout must be kept for signs of green fly as calla lily is highly susceptible to that. Propagation is done by removing suckers from the base of plants in spring, which are ported and rooted and approximately 18`BAC temperature. Though callas make excellent cut flowers and are available at high end florist shops, some communities associate them with death and mourning so be careful and do not make the mistake of sending them out as "Get well soon" bouquets.